Just about everyone has their own strategy and tips for dealing with stress. Stress today can literally appear from virtually anywhere and strike someone at virtually any angle. Considering the busyness of the modern lifestyle, it is no wonder why stress levels are so high. Rather than have those unhealthy stresses build-up, why not try a different kind of coping skill and relieve those stresses naturally through these 5 foods and beverages? A high protein food, pork and beans works to help reduce depression-like feelings and anxiety. Does the knowledge that you’re about to encounter stressful events during your day make you apprehensive? Do you get frustrated when the expectations that you’ve had for a given moment in time don’t come to fruition? By investing a few moments to have pork and beans as a snack, you’re giving your body a chance to fight back against these feelings. Tea has long been known for its calming effects. Many people choose to drink some decaffeinated tea at bedtime because it helps to prepare their body and mind for a good night’s sleep. If you have some green or black tea that you consume throughout your work day, you’re preparing your mind to analyze situations proactively and can react to a stressful situation analytically instead of emotionally. Are you finding that this day is particularly stressful? You can reduce the effects of a stressful day by eating spinach, soybeans, or pumpkin seeds. These foods work to give your body a virtual barrier to the physical components of stress that can negatively affect you. They help you stay in control mentally and reduce physical symptoms that you might be experiencing! 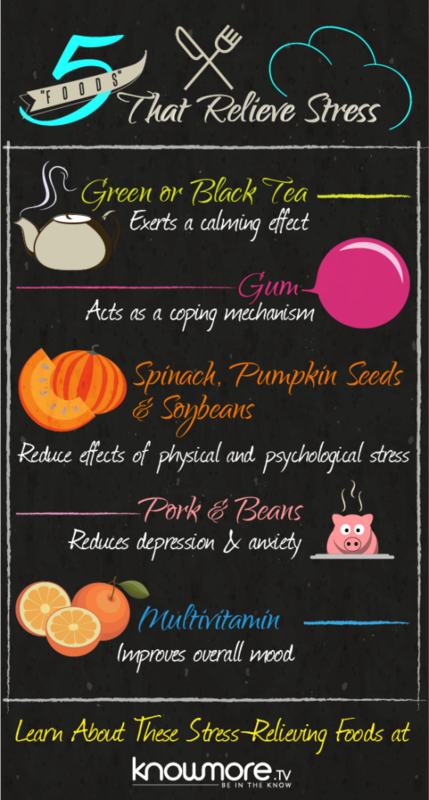 We can’t always prevent stress, but these foods can help get you into a better place where you can cope with stress. Sometimes we need to distract ourselves in order to be able to properly cope with stress. Music, a favorite movie, or even triple chocolate fudge ice cream can be effective distractions, but none of these have the power of chewing gum. Chewing some gum is a form of exercise and any exercise can help to relieve stress and prompt your mind to come up with a solution out of a problem that you may be having. A daily vitamin improves your overall mood because you’re feeding your body the essential vitamins and minerals that it needs for proper functioning. Many times we feel tired and fatigued not because of stress, but because of poor dietary choices. Then add stress on top of feeling bad physically from a poor diet and a bad mood is easy to find. Multivitamins help to prevent this from happening. Stress is going to hit you somewhere, at some time, no matter what you try to do. Whether you are reacting to stress or trying to be proactive about it, these 5 foods can help. Make the effort to include them into your daily routine so that you can better cope with stress when it comes your way!